San Fabian. The Parish Pastoral Council of the Parish of St. Fabian, Pope and Martyr met yesterday, 29 April 2009, Wednesday to discuss parish programs and plans for the coming months. The meeting was called by Rev. Fr. Oliver E. Mendoza, the parish priest. The Parish Pastoral Council is a representative group of Christian faithful who by their counsel assists the parish priest in the sound administration and effective pastoral governance of the parish. The PPC is composed of the presidents and coordinators of the different parish religious organizations and movements, as well as parishioners appointed by the parish priest for their fi eld of expertise. By its very nature, the PPC is an advisory or consultative body to the parish priest who has the final and accountable decision in the parochial agenda in accord with the provisions of Church Law and in line with Archdiocesan policies and norms. The main agenda of the meeting was the organization of the working committees that will prepare, coordinate and effectively put into action the different activities and programs in line with the celebration of the Vicariate III celebration of the Christ the King which the Parish of St. Fabian will host this coming November 2009. Different committees with their respective chairpersons and coordinators were formed. The following are the chairpersons and members of the working committees: Committee on Worship (Chairperson: Sis. Lilia Santos with the presidents of the Lectors and Commentators, Lay Eucharistic Ministers (EEM), Adoration Nocturna, Mother Butler Guild, Usherettes, Choir Directors, Ministry of Altar Servers as members. Committee on Christian Education (Chairperson: Bro. Tony Supremido with the Coordinators of the Basic Ecclesial Communities, Catechetical and Family and Life Apostolate, Parish Youth Apostolate Committee, Parish Renewal Experience, Couples for Christ, Charismatic Movement. Committee on Finance (Bro. Gregorio de Guzman, Chairperson with Sis. Alicia Gubatan and Sis. Filomena Sagun, as Coordinators of the Sub-Committee on Solicitation. Other members are: The Parochial Board on Church Temporalities, and all the presidents of the different Religious Organizations. Committee on Church Construction and Improvements (Bro. Santiago Alhambra, Chairperson). Committee on Lights and Sound System (Bro. Jessie Romero). Committee on Procession and Route Decoration (Bro. Diosdado Vallejos, with the members of the Knights of Columbus, and Bros. Joey Estandarte and Leo Carrera). Committee on Souvenir Program (Bro. Josefino Abrigo, Chairperson). Committee on Peace and Order (Bro. Martin Estayo and the members of the Holy Name Society). Committee on First Aid and Health (Dr. Leopoldo Manalo, Chairperson). Committee on Accommodations (Sis. Rowena A. Nicer, Chairperson with Sis. Remy Zarate). Fr. Oliver E. Mendoza also gave an orientation to the body regarding the on-going pastoral program of the parish involving the visitation of the image of the Blessed Virgin Mary to all the barangays. The visitation which will last for a week in all the barangays is an opportunity for evangelization. Two levels of formation will be given to the barangays: the youth and the adult formation. The youth will undergo a three day Youth Encounter seminar; the adult will undergo an adult formation program which will mainly consist of the adult catechetical weekend seminar on Family and Life, Basic Doctrines and the Bible. Foremost in the list of projects of the PPC is the construction of the covered pathways linking the church, the parish center and the Mt. Carmel Chapel. Also considered are the improvement of the church patio, and given the resources, the construction of the Parish Pastoral Center which will house the different offices of the parish apostolates, including the Parish Credit Cooperative. San Fabian. Another Parish Renewal Experience (PREX)weekend seminar was held in the parish as part of the continued formation of the parish adult formation program. The weekend seminar started at 6:00 PM of 24 April 2009, Friday. It ended in the afternoon of 26 April 2009, Sunday. PREX Class 35 led by Sis. Fina Ibasan sponsored this weekend seminar. The sponsoring classes invite participants, prepare and coordinate the weekend. They cook, serve and act as facilitators for the different activities and ceremonies of the renewal. Fr. Oliver E. Mendoza gave the eleven talks of the weekend seminar. Sis. Weng Tercero was chosen as PREX Class 36 Coordinator. 29 April 2009 – San Fabian. More than 50 youth of the Parish Youth Apostolate Committee of the Parish of St. Fabian, Pope and Martyr, joined the Archdiocesan Youth Day held in the Parish of the Holy Cross, Laoac, Pangasinan. The Archdiocesan Youth Day (AYD) is the annual gathering of the youth of the Archdiocese. The Holy Cross Parish hosted this year’s AYD celebration from 21-24 April 2009. This year is the 14th year of the AYD. Its theme was “ You will receive power when the Holy Spirit has come upon you and you will be my witnesses." (Acts 1,8). Msgr. 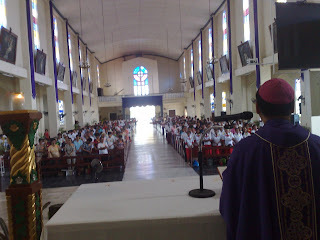 Renato P. Mayugba, DD, the Auxiliary Bishop of Lingayen-Dagupan presided over the opening mass. Msgr. Oscar V. Cruz, DD, the Archbishop of Lingayen-Dagupan, celebrated the culminating mass on the last day of the four day youth celebration. It was announced to the whole assembly during the mass that the 15th AYD will be held in the Parish of the Annunciation of the Lord, Bonuan Gueset, Dagupan City. The AYD was coordinated by the Archdiocesan Youth Apostolate. Fr. Manuel S. Bravo, Jr is the Archdiocesan Youth Director with Fr. Erci Galivo, the Youth Coordinator. Fr. Alvin Platon hosted this year's AYD. He is the parish priest of the Holy Cross Parish, Laoac, Pangasinan. 19 April 2009 – San Fabian. The Feast of the Divine Mercy was celebrated in the Parish of St. Fabian, Pope and Martyr this Sunday, joining the whole Church in celebrating this great feast. This Feast was granted to the Universal Church by Pope John Paul II on the occasion of the canonization of Sr. Faustina on 30 April 2000. In a decree dated 23 May 2000, the Congregation for Divine Worship and the Discipline of the Sacraments stated that "throughout the world the Second Sunday of Easter will receive the name Divine Mercy Sunday, a perennial invitation to the Christian world to face, with confidence in divine benevolence, the difficulties and trials that mankind will experience in the years to come." The whole of Sunday afternoon was devoted by the Parish for the observance of this great Feast. A Holy Hour in adoration of the Blessed Sacrament with Benediction was celebrated. While this was being celebrated, the Sacrament of Reconciliation was made available for the hundreds of parishioners and devotees of Divine Mercy. A Holy Mass was celebrated at 4,30 PM. These were done in accordance to wishes of Jesus when He spoke to St. Faustina: the soul that will go to Confession and receive Holy Communion shall obtain complete forgiveness of sins and punishment. On that day all the divine floodgates through which grace flow are opened. Let no soul fear to draw near to Me, even though its sins be as scarlet. My mercy is so great that no mind, be it of man or of angel, will be able to fathom it throughout all eternity. Everything that exists has come forth from the very depths of My most tender mercy. Every soul in its relation to Me will I contemplate My love and mercy throughout eternity. The Feast of Mercy emerged from My very depths of tenderness. It is My desire that it be solemnly celebrated on the first Sunday after Easter. Mankind will not have peace until it turns to the Fount of My Mercy. (Diary 699). 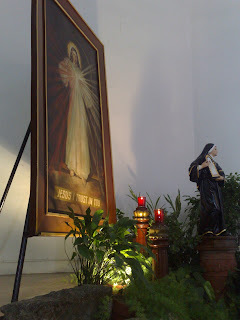 The images of the Divine Mercy were blessed after the Mass. This was followed by a procession in honor of The Divine Mercy. Testimonies from the parishioners were shared regarding how their devotion to the Divine Mercy has greatly affected their lives. Some bore testimonies to the miracles they have received from the great Mercy of God. (One was about the miracle received by Danny of Barangay Bigbiga. Although, he was not able to give his story, Fr. Oliver E. Mendoza, the Parish Priest, could attest to the wonderful grace that God has given to Danny). 12 April 2009 – San Fabian. During the celebration of the Evening Mass of the Lord’s Supper on Holy Thursday, parishioners who have rendered dedicated service to the parish have been given Certificates of Recognition and Appreciation. These parishioners received the recognition for at least giving 20 years of dedicated and continued service as Lector and Commentator, Lay Eucharistic Ministers and Catechists. The following received a Certificate of Appreciation: Bro. Epifanio Ceralde (Lay Eucharistic Minister), Sis. Filomena Sagun, Sis. Betty Ganay, Sis. Alicia Zamudio, Sis. Lourdes Patungan (Catechists). The following received Cerificates of Recognition, and their corresponding years in the ministry: Sis. Alicia Z. Gubatan (29 years as Lector/Commentator). As Lay Eucharistic Ministers: Bro. Santiago C. Alhambra (35 years), Bro. Gregorio de Guzman, Jr (35 years), Bro. Faustino D. Ferraro (23 years), Bro. Ildefonso D. Viernes (21 years), Bro. Rufo Fabia (20 years), Bro. Ceferino M. Baltazar (20 years), Bro. Francisco M. Baltazar (20 years), Bro. Pedro C. Tamondong (20 years), Bro. Evasito Narvas (20 years), Bro. Diosdado Vallejos (21 years). 12 April – San Fabian. The Jesus Nazareno. Santo Bangkay. Mater Dolorosa. These are the three images that the parishioners of the Parish of St. Fabian had come to venerate, and reflect upon during the Holy Week. The image of Jesus Nazareno is the suffering Christ; Jesus depicted as carrying the cross, crowned with thorns, wounded and in pain. The Santo Bangkay is the Messiah who had suffered the pain of death. It is the image of Jesus after his death on the cross who had been prepared for burial. Jesus lying in death… before His resurrection. Mater Dolorosa is the sorrowful mother who witnessed the suffering and the death of her Son. What pain and anguish Mary must have felt in her sorrowful heart. These are the images of Holy Week for the parishioners to reflect upon. They come to venerate them, and felt the pains and sufferings depicted in their images. These images have given the suffering people hope and consolation. They know and believe that Jesus, the Christ and her mother, who had experienced sadness and suffering, will not leave us in these “vale of tears”. These statues of Holy Week had just been restored. The Santo Bangkay, through the generous donations of good people of San Fabian, has received a new carosa. It was made of narra from the trees of the parish felled by Typhoon Cosme last May 2008. Both the Jesus Nazareno and Mater Dolorosa received new garments. 12 April – San Fabian. Salubong is a very unique Filipino Easter tradition. The word salubong refers to the act of meeting someone who is arriving. As the word connotes, the celebration is a reenactment of the first meeting of Christ and his mother, Mary. In the Pangasinan language, this is translated as “Abet-Abet”, literally meaning “encounter”, “meeting”. The Parish of St. Fabian, Pope and Martyr, greeted Easter Sunday with the celebration of Abet-Abet at 5:00 AM. The statue of the Blessed Virgin Mary, with her black veil, was accompanied in procession by the women of the parish. The resurrected Christ was accompanied by the men. The “abet-abet” or meeting of the resurrected Christ and Mother Mary took place in front of the church patio, just below the arc of the entrance of the church gate. At the encounter, an angel removed the veil of mourning of Mary. The white veil, signifying the easter joy felt by Mary upon seeing her resurrected Son, was then draped over Mary’s head and shoulders. Then the angels, children who were dressed as angels, sang “Regina Coeli Laetare” (Queen of Heaven, Rejoice). All the angels then one by one climbed the steps prepared for the celebration and showered Mary with flowers. A procession to the church with the statues of Jesus and Mary then followed. The first Mass of the day followed the “Abet-Abet”. Mrs. Lucrecia Ungria, Ms. Joy Quiros and some other parishioners took charge of the holding of the Abet-Abet. Angels (children) climbing the stairs to shower Mother Mary with flowers. The procession to the church after the “abet-abet” or meeting of the resurrected Christ and the Blessed Virgin Mary. 9 April – Dagupan City. The Archdiocese of Lingayen-Dagupan celebrated the Chrism Mass on 9 April 2009, Holy Thursday at the St. John the Evangelist Parish, Dagupan City. The priests of the Archdiocese renewed their commitment to priestly service in front of the Archbishop and the people of God. This renewal of commitment to priestly service is performed every year during what the Roman Catholic Church calls as the Chrism Mass, usually the largest annual gathering of clergy held either on or before Holy Thursday. The priests then gather around the Archbishop as he blesses the holy oils to be used during the upcoming year for the sacraments of baptism, confirmation, ordination and the anointing of the sick. The yearly commissioning of the Lay Ministers was also held during the Chrism mass. The Archbishop commissioned once again hundreds of lay ministers who act as lectors and commentators during the mass, as well as the Lay Eucharistic Ministers or the Extra-Ordinary Eucharistic Ministers. Archbishop: At your ordination you accepted the responsibilities of the priesthood out of love for the Lord Jesus and his Church. Are you resolved to unite yourselves more closely to Christ and try to become more like him by joyfully sacrificing your own pleasure and ambition to bring his peace and love to your brothers and sisters? Archbishop: Are you resolved to be faithful ministers of the mysteries of God, to celebrate the Eucharist and the other liturgical service with sincere devotion? Are you resolved to imitate Jesus Christ, the head and shepherd of the Church, by teaching Christian faith without thinking of your own profit, solely for the well-being of the people you were sent to serve? Archbishop: (to the people) My brothers and sisters, pray for your priests. Ask the Lord to bless them with the fullness of his love, to help them be faithful ministers of Christ the High Priest, so that they will be able to lead you to him, the fountain of your salvation. The Archbishop in his homily shared his thoughts on UNITY, and its fruits. He talked about its opposite as the work of the evil one. “Where there is division and disunity, there is the devil,” he said. He urged the people to work and preserve peace in the family, in the community, in the country. He urged the priests, as he personally talked to them, after his homily, to be agents of unity, not powerful agents of scandal and disunity. He said that three things have caused scandal and disunity among our people: love of money, love of the flesh and love of power! Msgr. Renato P. Mayugba, DD, the Auxiliary Bishop, concelebrated with the Archbishop. He handed over during the simple ceremonies during the mass, the trophies to the different winners of the Mission Sunday collection contest. Fr. Enrique V. Macaraeg, the Archdiocean Missions Director, read the winners in the parish and school categories. Archbishop Oscar V. Cruz, DD with Bishop Renato P. Mayugba, DD, the Auxiliary and Msgr. Rafael S. Magno, Jr, Vicar General. 9 April, Holy Wednesday – San Fabian. The Parish of St. Fabian, Pope and Martyr, meditated once again on the different Stations of the Cross last 8 April, Holy Wednesday. The Barangay which hosted the meditation was Barangay Nibaliw East. The first station was held at the house of Mr. and Mrs. Blas Narvasa. The Holy Wednesday Stations of the Cross provides the parishioners the opportunity to meditate on the suffering and death of our Lord Jesus Christ, especially for those who cannot climb the steep terrain of Inmalog Sur. The meditation started at 2:30 PM. 3rd Station Mr. and Mrs. Jose Abalos, Jr. The 14th station was done at the patio of the Church, at the Pieta. The 15th station was proclaimed inside the church. The Parish Youth Apostolate Committee once again provided the tableau for the different stations. A holy mass was celebrated by Rev. Fr. Oliver E. Mendoza after the stations of the cross. The 14th Station in front of the Pieta at the Church patio. 7 April, Holy Tuesday – San Fabian. The meditation of the Stations of the Cross in Brgy. Lipit going up to Brgy. Inmalog Sur has been held in the Parish of St. Fabian, Pope and Martyr since 2004. The place is a hilly, upland route of about two kilometers. The fourteen stations are scattered along the main road. Before the Inmalog-Lipit boundary, it turns right for the12th and 13th stations. The 14th station is located at the peak of Inmalog Sur overlooking the plains and seas of San Fabian. The Parish Youth Apostolate Committee (PYAC) provided the tableau for each of the 14 stations. They portrayed the scenes in their costumes which were prepared by them. The youth of the parish started portraying the different scenes of the stations of the cross in 2006. While the faithful were meditating from one station to another, confessions were being heard by Fr. Oliver E. Mendoza, the parish priest. Bro. Estephen Espinoza and Bro. Tony Supremido led the meditations and the prayers. The Stations of the Cross of the Divine Mercy or “Say Estasyon na Krus na Madibinon Panangasi” was used as the guide for the meditations and prayers. The Stations of the Cross started at 3 o'clock in the afternoon after the whole assembly prayed the Chaplet of the Divine Mercy. A mass was later celebrated at the Inmalog Sur boundary site between Lipit and Inmalog Sur, after the stations of the cross. It was celebrated by Fr. Oliver E. Mendoza. The faithful at the First Station at Brgy. Lipit. 5 April - San Fabian. The Second Archdiocesan Congress on Divine Mercy was held recently in the Parish of St. Thomas Aquinas, Mangaldan, Pangasinan. It was celebrated last 4 April 2009, Saturday, a day before the start of the Holy Week. The 2nd Archdiocesan Congress came following the First Archdiocesan Congress on The Divine Mercy which was celebrated last year at the Parish of St. Fabian, Pope and Martyr. Many devotees and the faithful of the parish who had been touched and transformed by the Mercy of God attended the one day affair. The Apostles of the Divine Mercy of the Parish of St. Thomas Aquinas (Mangaldan) led by Sis. Silvana de Vera and Sis. Lourdes Campued organized and prepared the hosting of this year’s congress. Msgr. Renato P. Mayugba, DD during the mass also announced that the Third Archdiocesan Congress on Divine Mercy will be celebrated next year in the Parish of St. Ildephonse, Malasiqui, Pangasinan. Hundreds of devotees and participants to the 2nd Archdiocesan Congress on Divine Mercy join Msgr. Renato P. Mayugba, DD in celebrating the mass culminating the congress.